Perhaps this one of the most important discussion threads ever regarding Legacy Media manipulation. We sincerely hope you will take the time to digest the content, think about the ramifications to what is here, and then share the information with others. This is not a matter of opinion, the CNN stories are documented, attributed and cited. They are factual. Everything is verifiable within the embedded links and citations. Believe it or not, just creating this discussion thread is risky. We are unable to expand. Before getting to the CNN Amber Lyon expose’ (which is incredible and troubling) let’s first back up a moment and take you back to a previous video we shared surrounding recent events. In this first video from Canada the topic is the Libyan US Consulate Bombing and the US Egyptian Embassy being overrun. While the topic of Egypt is a ‘component’ of the issue, it is not our central concern. The central issue is Media Controlled by The Obama Administration, and more specifically CNN – as a VERIFIED tool for propaganda and disinformation. Within this Canadian video report you will find footage of a CNN story on Egypt and Mohammed Al Zawahiri. It was produced by well-known CNN Journalist Nick Robertson. The entire video is excellent, but the pertinent aspect is at the 1:30 mark. Why would CNN [or CNNi] refuse to air the Nick Robertson report with Muhammed Al Zawahiri (brother of Ayman Al Zawahiri) that clearly shows the Egyptian uprising was 100% in response to his call for protests for release of the Blind sheik on 9-11.? Why would the “most trusted name in news“, hide the report showing the truth, and instead allow the false narrative to be sold, by them, to the American electorate? Amber Lyon provides the answer(s). CNN never aired the Nick Robertson report in Egypt because it completely contradicted President Obama and Hillary Clinton’s assertions. In short, the Robertson report, if aired, would have proved Obama and Clinton were lying. The Nick Robertson CNN report was filmed on 9/11/12, yes the exact morning of the Cairo embassy protest, and, by coincidence, it would have aired at the exact moment Hillary Clinton and Barack Obama began attributing the Egyptian embassy protest to a “U-Tube Video”. A U-Tube Video the U.S. Cairo embassy itself was unaware of until 9/9/12. CNN’s refusal to air the real reasoning for the Egyptian Embassy protest turned assault was intentional protection of President Obama, specifically orchestrated by the CNN News group, at the behest of the White House. Specific, intentional, lying. Apparently they have a history of this no-one knew about. UNTIL NOW. 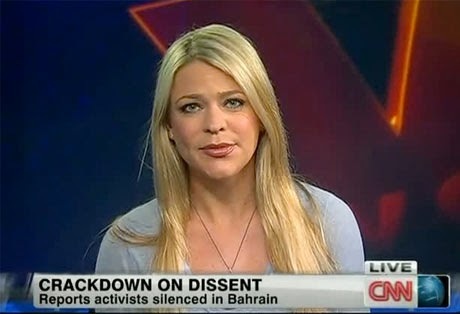 Amber Lyon is an award-winning journalist who worked for CNN. She says she was ordered to report fake stories, delete unfriendly stories adverse to the Obama administration (like the Nick Robertson report), and construct stories in specific manners while working for the left-wing network. CNN is paid by foreign and domestic Government agencies for specific content. Let me repeat that. CNN is paid by the US government for reporting on some events, and not reporting on others. The Obama Administration pays CNN for content control. Let that sink in. Alex Jones is easy to disregard as a “conspiracy theorist”, not because of what he says, but because of how he says it. Everything is desperate and dangerous with him. It is critical to listen to what she says, not just about Bahrain but also about what the Obama administration is specifically doing. Just try to overlook the Alex Jones-ism, and focus on what Amber Lyon is sharing. News Anchor Completely Loses It For The Best Possible Reason - Must See!